Finally, a Mega Man game I can clear in 90 minutes. Is that what you want too? Two years after Mega Man 9 returned the classic Capcom series to 8-bit, classic Nintendo Entertainment System design, Mega Man 10 is upon us, with an offer that is decidedly not old school: An easy game. But it's easy only if you want it to be. Speed Run: I tried playing Mega Man 10 on normal difficulty. I tried to let the game's simple sprite graphics and bleeping music take me back to my childhood self — he of the greater dexterity and higher tolerance for dying — but I could not survive in Capcom's game for more than five minutes before touching an instant-kill spike, falling down an instant-death pit or (the worst!) experiencing that horrible old-school thing of killing an enemy on the screen, moving ahead, retreating to the earlier area and seeing that that enemy was back. Easy Mode was the thing for me. 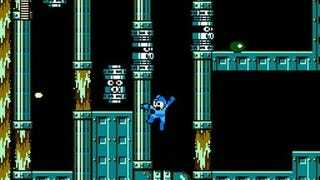 Easy Mode, my salvation and a numbered Mega Man first, according to Capcom, presents fewer and different enemies laid out in levels that have red safety platforms capping some of the bottomless pits. Hooray! Best of all, playing through this game on easy mode allowed me to witness some of the clever — occasionally wickedly clever — jumping challenges. In theory, I could try them with the safety net of Easy and then have a better shot of clearing them in Normal. Great. That way I could actually play the excellent truck-jumping section. That's better than having to "play" this game by watching someone speed-run it on YouTube. Nostalgia Not Necessary For Enjoyment: There are moments during Mega Man 10's dozen or so levels in which you fight new bad guys like Sheep Man and robots that emulate what I assume are classic Mega Man foes. Some girl who may or may not be from Mega Man lore gets sick with Robofluenza, a sickness that afflicts robots and may or may not be a hallowed element of Mega Man lore. It doesn't matter. If you are such a huge Mega Man fan that you know Mega Man's middle name (what is it??) then I'm sure you'll love the parts of this that refer to classic Mega Man fiction. If you're me, who hasn't played a Mega Man since I was learning trigonometry and remembers none of it, you instead get the experience of visiting a foreign country that seems to have its own evolving culture. Who cares if I miss the references? At least there's some sort of bizarrely consistent dream logic to the sci-fi fiction here. Extras:Mega Man 10 can last you longer than 90 minutes not just if you subject yourself to the game's normal and hard modes or replay the game using alternate hero Proto-Man, it will also last you a while to beat the game's 80 or so unlockable challenge stages, which involve everything from running across a room to beating one of the game's eight main bosses without taking damage. For some gamers, old-school is a turn-off. For others it's a delight. How to please all? Mega Man 10. Mega Man 10 was developed by Inti Creates and published by Capcom for the Wii, Xbox 360 and PlayStation 3 on their respective downloadable services on the week of March 1. Retails for $10.00 USD. A copy of the game was given to us by the publisher for reviewing purposes. Beat this game in 90 minutes, or did I mention that already?